Adds clock to UI that displays either game world time or real time (depending on settings). While playing World of Warcraft I realized that having clock as element of UI is quite convinient. This mod does exactly this - adds a clock frame that can display either in game time or real time in 12/24h mode, depending what options do you prefer. Thanks to Merlord for his script allowing to convert GameHour global to format understandable for mere mortals. 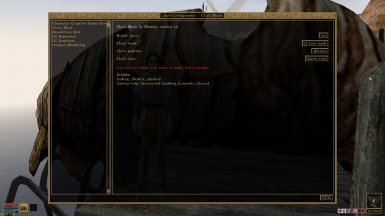 Also thanks for Morrowind Modding Community Discord for feedback and other help. For now (that is 10th of Jan 2019) mod is incompatible with "Get Lost" by NullCascade.